The first International Social Prescribing Day – what a whirlwind! Our event in Salford yesterday as part of the first ever International Social Prescribing Day was a fantastic opportunity to learn about the variety of work across the locality and region. Over 50 people came from a variety of backgrounds: link workers, health and social care professionals, voluntary sector and community organisations, social enterprises, commissioners, local authorities, higher education – bringing together an impressive concentration of expertise. Seeing the interest in the room, echoing events around the country, and trending on twitter (see below), emphasises the swelling interest in putting person-centred approaches at the centre of so much work, and of the significant shift from ‘what’s the matter with you’ to ‘what matters to you’. Hosted by the Working Class Movement Library – a fantastic resource in Salford – we were welcomed by Lynette of the library who detailed the breadth of their collection (from Peterloo and the suffragette movement, to the miners’ strikes and recent anti-war protests), and invited us to make use of the library and spread the word about this “hidden gem”. We were also delighted to have Alison Page, CEO of Salford CVS, chair the event – and to keep things impressively smooth and to schedule! Dr Tom Tasker, who splits his time between chairing Salford CCG, chairing CCG work at a Greater Manchester level, and a practicing GP in Eccles, took time away from his practice to give us an insight into the GP’s perspective on social prescribing. Tom talked first about the challenges faced by GPs, and then the opportunities that social prescribing offers – saying it’s the best £1million spent by Salford CCG – before giving an example of one of his patients who has turned his life around following an ‘arts on prescription’ referral to START in Salford. We took inspiration from Salford’s Wellbeing Matters programme: Wendy Ryan from Salford CVS gave an overview of the programme, and Nicola Spiby on her role coordinating the Community Connectors, and then Charlie, one of the Community Connectors, gave a passionate and vivid account of the Connector/link worker role, and why she does what she does. “You can’t be wet behind the ears to do this job,” she pointed out – Connectors need to have the lived experience in order to listen to people and build trust with them to make it meaningful – and it can sometimes be tough to offer a listening ear to someone who isn’t used to being listened to: “it’s like opening Pandora’s box”. But Charlie, like the rest of her team, is resourceful and rooted in her community – we only wished afterwards that we could have recorded her passion to share with others. Salford is lucky to have its Community Connectors. We then had the opportunity to talk about our work in Salford University, and the launch of our Salford Social Prescribing Hub! Andrea Gibbons detailed the work she and Michelle Howarth did on mapping the variety and types of social prescribing across Greater Manchester. The report on this work will be published shortly – watch this space. Then Cormac Lawler gave an overview of the Salford Social Prescribing Hub – its interdisciplinary nature, person-centred focus, and its commitment to bringing a solid theoretical foundation to creating practical resources that will help practitioners in their work and improve outcomes for the people at the centre. One of these resources is the tool and training we have developed for link workers, based on Occupational Science – and Cormac extended the invitation to anyone who is interested in the tool to partner with us and use and improve it. Our hub is one of many networks and strategic and coordinating bodies on social prescribing. Jo Ward outlined her role as coordinator of the North West Social Prescribing Network and invited everyone to join both the regional and the national Social Prescribing Network and get involved in the conversation – including the current consultation on Quality Assurance for Social Prescribing. And Giles Wilmore of the Greater Manchester Health & Social Care Partnership highlighted the strategic work ongoing at a GM level, understanding and disseminating good practice across the ten GM boroughs, and echoing strategic work across the country, such as NHS England’s personalised care agenda. We were transported through stories to transformational spaces… Michelle Howarth presented the exciting work at RHS Garden Bridgewater, which includes setting up a new social prescribing pathway to its wellbeing garden (on which the Hub is evaluation partner), with Ozichi, the new-in-post therapeutic horticulturalist, giving us a flavour of what her role will involve. Heather Henry gave an insight into the ‘Dadly Does It‘ work she has been doing with men in working class communities who often feel that services do not cater for them and are therefore reluctant to engage, and how she and colleagues have addressed this to create men-friendly services and spaces. On 27th February, Salford’s Community Connectors came to the University of Salford to learn about the Salford Social Prescribing Tool and explore how it could help them with their work. 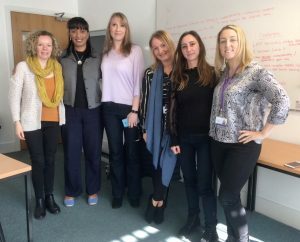 In order to give some insight into the tool and where it comes from, Sarah Bodell from the Hub gave an overview of Occupational Science – its history, focus and key concerns – and discussed its resonance with the Connectors’ view of their work. Sarah also outlined what we’ve gleaned from speaking to link workers, as well as surveying the literature on link working, before going onto discuss. Health Education England’s Competency Framework for Care Navigators. This gave a good opportunity for the Connectors to talk about what they do and how they see their role. The Connectors are deeply passionate about the nurturing aspect of their work: it’s not about ‘doing things to the person’, or ‘getting the person to do things’; it’s about empowering the person, and supporting them to do what they want to do. We then took some time to examine the assessment tool we’ve developed, and to put it into practice through a rehearsal exercise (similar to role-play) – exploring what kinds of responses are elicited by particular questions, and how to use information gathered to build a holistic assessment and meaningful referral. It was a great day overall, and we got some really useful feedback on the tool, which will enable us to improve it – which is our current phase of work on developing the tool. We will be continuing the discussion with the Salford Community Connectors team about how they will be using the tool, which will then inform and shape whether and how our tool will be integrated within the Salford CVS Elemental platform (which would be another exciting development for us). The Salford Community Connectors are a fantastic group of people, and we feel very privileged to be working with them.